"Manti is a famous meal from my country. To prepare this dish takes time, but I'm sure you'll agree it's worth it! Enjoy-afiyet olsun (bon appetit)!" Combine the flour and salt in a mixing bowl. Add the eggs and water, mixing well with your hands. Add more water, if needed, to form a soft dough. Cover and set aside for at least 30 minutes. Shred the onions and place them in a colander or sieve set over a bowl; drain the juice and discard. Combine the onion, ground beef, salt, and pepper; mix the meat well with a spoon until mashed. Divide the dough into two portions and lightly flour a work surface. Keep one piece of dough covered while you roll out the second portion into a rectangle, rolling the dough as thin as you can. Cut the rectangle into 2-inch squares with a knife or pastry wheel. Place about 2 teaspoons of the meat filling in the center of each square. Seal the dumplings by gathering the edges of the dough and pinching them together at the top to form a bundle. Transfer the finished manti to a floured plate, and sprinkle more flour over the manti to prevent sticking. Repeat with the second piece of dough. Heat the oil and red pepper flakes in a small skillet over low heat just until the pepper flakes have started to color the oil; don't let them burn. Remove from the heat and keep warm. Stir the minced garlic into the yogurt and set aside. Bring a large pot of salted water to a boil over medium-high heat, and cook the manti until the filling is no longer pink, and the dough is tender, 20 to 25 minutes. Drain well. Divide the manti among four plates. 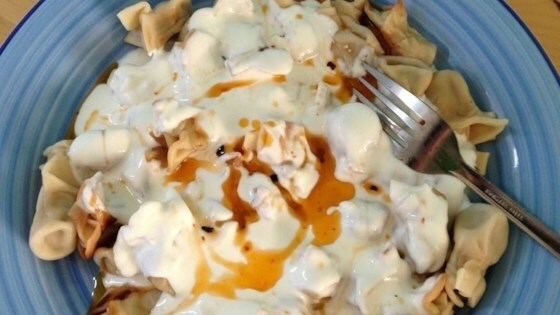 Spoon the yogurt sauce over the manti and drizzle each serving with the hot pepper oil. You can use ground lamb or other ground meat in place of the beef, if you prefer. I loved this recipe and so did my family. If you were in a hurry you could use pre-made wonton wrappers instead of making the dough. when i made them, they werent good at all. its very dry, and my family and i didnt enjoy it. i tried to so many ways to enhance the flavor, but no luck. you should try changing some ingredients. Whew! This is not a recipe for beginners! It took me about 2 hours of straight work to get this recipe finished. It was really awesome when we actually got to eat. I was proud, but exhausted!